Like the image and quote suggest, writing can be like bleeding. I am constantly in awe of writers who can whip out a flash fiction for a writing prompt like my blogging buddy and friend, PJ from Beautiful Words. Or another fellow blogger who writes amazing stories in the Fantasy and Sci-fi genre, Phoenix Grey. Please read their blogs to be inspired by their writing talent. Fiction does not come out of me very easily. I really do not know how fiction writers do it. I was a journalist in high school and I write non-fiction. I categorize myself as a reporter, or at best, a features writer. That is the voice of my blog. I record and write what I see and experience. It might be a reaction to something I have read or have seen via media, or something I saw with my own eyes. Being forced to put pen to paper or fingers to keyboard can be costly in terms of time and to the slightly fragile ego of this writer. I think that is why I love photography so much. When I take pictures of the places I visit, somehow the photo expresses the message better than I could ever write it. The old cliché, “a picture is worth 1000 words” is true in my book (if I could write one). I have been inspired by photos and have written great descriptions. I rely heavily on the concrete visual for which to be inspired. Oddly, when there is a photo that someone wants captioned, I fail at that as well. I suppose it takes too much imagination to write a clever caption. I certainly appreciate a great caption when I read one. Writing humor is also one of those skills that I appreciate and highly respect. I love to read humor and I admire those who can deliver. I have made several attempts at humor in my writing, some okay. With humor, I do better with the spoken word. By the time I write down the idea, I self-edit so much that the humor dries up completely and never makes it onto the page. What is this free writing costing me? Time? Proof that my imagination is as dry as the drought here in California? This is the time of evening I have my dessert. Be right back……………………………………………Okay, now I can concentrate. Chocolate works wonders. Clever me, that used up a few more words. Now I know how my students feel when they have to write papers with a word count. I wonder what writing costs them? Besides their grade. And please don’t grade this Writing 101 assignment. Today is a free writing day. Write at least four-hundred words, and once you start typing, don’t stop. No self-editing, no trash-talking, and no second guessing: just go. Bonus points if you tackle an idea you’ve been playing with but think is too silly to post about. Four hundred words. One at a time. Go. I can completely understand and relate to what you wrote here! It’s ironic because a friend of mine asked if I wanted to write about news, things going on in NYC, a more journalistic approach, in essence. I cowered at the idea because I don’t think I could do it! All of us have writers within…it’s just that our styles may be different — And what you say about photography is so true…Indeed, you’re able to capture the world with your lens and make 1,000+ words leap from the photograph without need of a keyboard or of a pen! Your talents and skills shine brightly throughout your blog because it is an honest and true view of what you’ve got inside…and you are unique in your style — and that’s what makes you AMAZING! Happy writing, my friend — and happy phototaking too…We are here with smiles on our faces and open arms…perhaps we can share some of your chocolate with you too? Big hugs from a finally warmer NYC! I’m so glad to be part of your writing journey with wonderful surprises, as you so perfectly said! The Stink Bug will definitely become my first book! Your inspiration helped to get me in gear! I love your way of writing, Terri. Every time I read your posts, the words flow clearly and easily, adding meaning and beauty to imagery, and vice versa. Knowing about your preferred style made me smile, as I felt like you wrote that, also on my behalf. I just found out another common feature between us. Besides cycling, windsurfing and chocolate. I have to digress though and add that you also can do other styles with mastery. I have enjoyed reading all your trials. 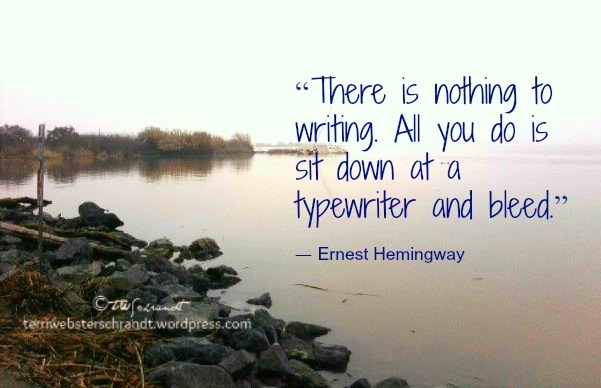 I love this, Terri, because it says so much about why all us writers are so different. I love writing flash fiction, yet I don’t like writing poetry. One day I want to publish my first novel, yet I could never write and publish an opera. We writers are all interesting, because we write in so many different and wonderful ways. Wouldn’t it be boring if we all wrote the same way? Thank you very much, Hugh. You are certainly a writer I hold in high esteem! I have received such great comments about this post which I wrote in 30 minutes (even with a chocolate break). Never expected any comments, let alone the kind ones I have been reading. I really appreciate your words. Thank goodness we are all different in our voices and approach! Thank you so much Terri, that is so kind of you to say. Oh my gosh, you are so kind! That really makes my day! Thank you so very much! What a wonderful free write for the assignment! Thank you so much for the very kind shout out! I am humbled! I think you are better at fiction writing than you realize. I need to do my free write but I have my hands full today cannning. I really enjoyed your free write story. Very interesting! Thanks! I only print the truth LOL! It was my pleasure! Great piece of writing. It was very honest, and it was pleasant to read because of it. I enjoyed your inner thoughts, and I am sure many other people can relate to what you are saying so good job. At least you have it done I am not sure what to write yet. It does make you think when it says 400 words. Well done. Thanks, Donna, but I’m a bad girl and haven’t written a couple of the other assignments. sigh! Which is the good thing about these it doesn’t matter if you miss some.